Before I give any description of the start or end of our anniversary, I must explain that my car keys are not the only Important Things that were lost last week. Last Sunday we returned from an immeasurably wonderful weekend with the fabulous jennamay in the Natal Midlands. * On the plane, I removed my WEDDING EARRINGS** and put them on my lap. Of course, as the flight landed, I stood up and went home only to realise the next day my splendid wedding earrings were missing . Sob! THEN, on Friday (i.e. Heritage Day) Stoffel insisted on taking the camera (our ONLY digital camera) on a hike across Table Mountain from the City Bowl to his parent’s possie in Constantia. *** He took a new, really tricky route up the mountain which required much clambering and hoisting of Cowboy. Near the top, he took a picture of Cow wedged in a particularly impressive crack with Cape Town stretching out beyond him. AND, that was the last any of the Hillratts (or their immediate associates) saw of the camera! my husband-of-one-year awoke wincing from a sore back (perhaps something to do with the clambering and hoisting of Cowboy?). Then I discovered the missing camera. Wraaahhh! Fury! Misery! We scuttled all our belongings into the car and shot down to the Constantia Woolies in case Stof had removed it there when he’d stopped in to purchase braai goodies after his walk. No luck. Still no breakfast by this time and my blood sugars were waning (and my lip was dragging along the floor as a result of the husband-losing-camera incident). Because we were all the way down the southern part of the peninsula, we popped in at Muizenberg for coffee and croissant on the beach: lovely? No: it was an absolute nightmare with (seemingly) thousands of surfers milling around trying set a Guinness record. We decided to tootle along the beach to the N2 and find food later (probably somewhere delicious, pretty and romantic). Unfortunately, about a quarter of the way along Strandfontein road we were turned around at a road block : a whale had beached itself and the extraordinary number of spectators had forced authorities to close the road. So we spent an hour driving around back to where we would have been in 20 minutes. A lot of this time I am being rather miserable/sulky/generally unpleasant. We pulled into the Engen 1 Stop roadside petrol station at lightening speed to fill up the car, with the idea that we would then hit the road to find something to eat (somewhere delicious, pretty and romantic). EXCEPT, then the car did not restart. At all. Helpful petrol attendants helped us push Suzi (an Isuzu bakkie) to the side and we called for the Automobile Association. I admit that, at this point, I suggested that the whole idea of going away to celebrate our baby marriage might just go to h-ll and that we should return to the Matchbox and sulk. (I may or may not have been close to tears. ****) To which Stof pointed out that we couldn’t even do that because were STUCK on the side of the highway eating Wimpy burgers with our fingers. AA arrived and (of course) Suzi started first time. Without coercion or assistance! We hit the road with blood sugar levels restored (generally much happier). 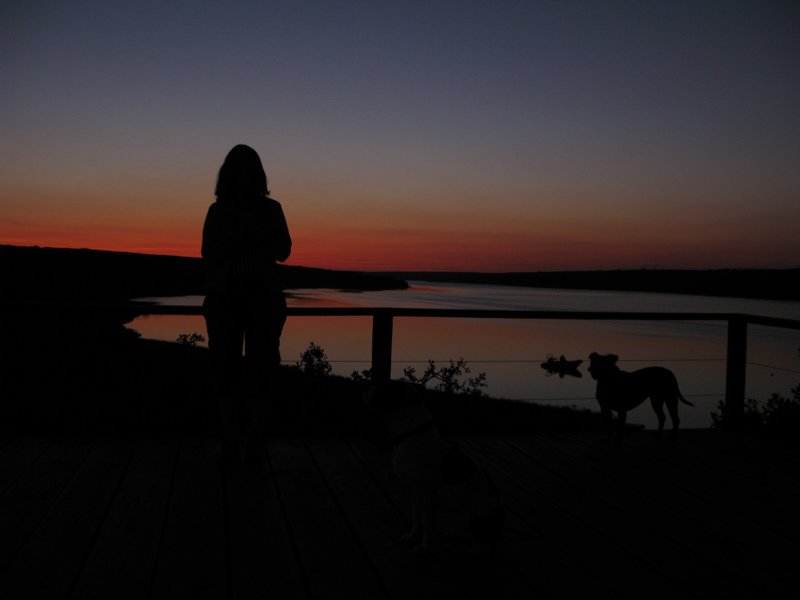 We arrived at the Breede River in time to unpack the car, feed the dogs, light a fire and open a bottle of wine while the sun set. We made a bloody delicious dinner of mushroom, asparagus and chorizo risotto which we ate in front of the fire while it rained outside. For the rest of our visit the weather was exquisite! All of our wedding trees (we planted 14 trees the day after our wedding) are still alive! Good omen (if nothing else). 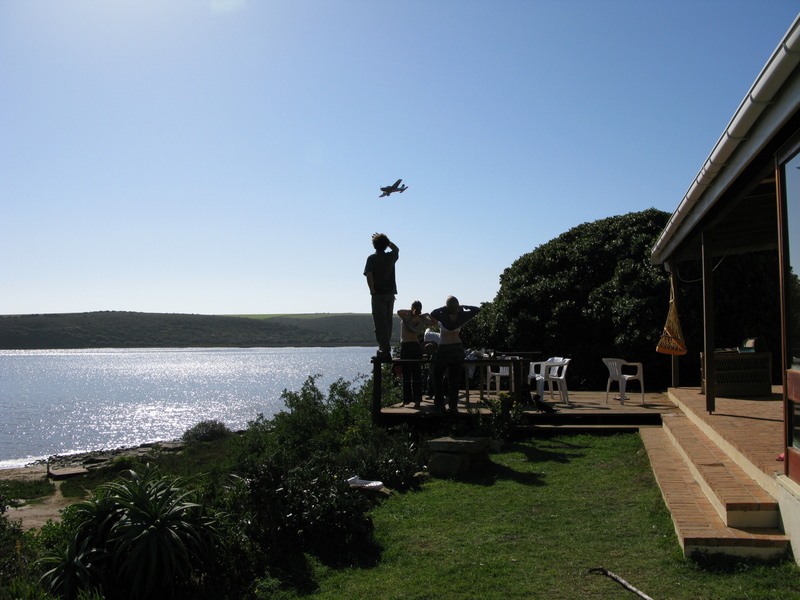 Here are some pictures of our little piece of paradise on the Breede. 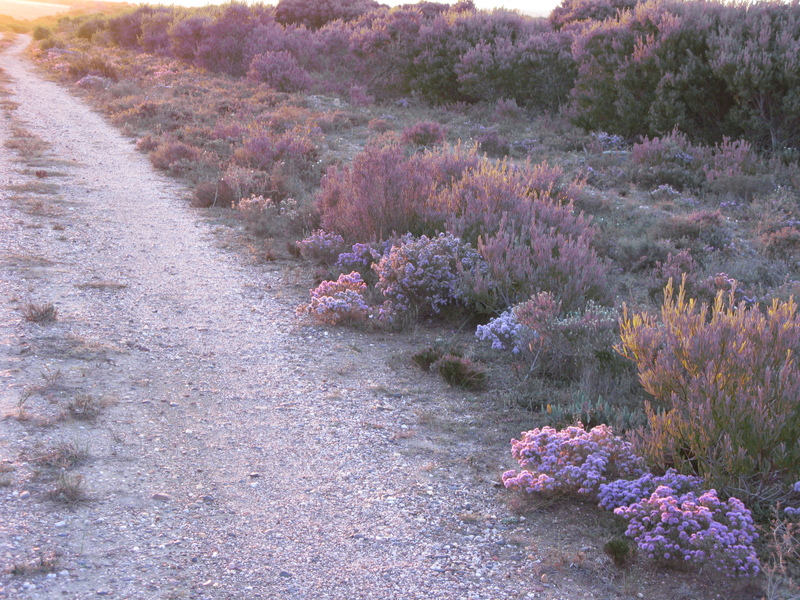 Obviously they aren’t from this weekend, but I’m desperate to have a photograph or two in this blog. Oh it’s lovely during daylight too! This from when our matey Larry flew up and “buzzed” us… hmm. The veld really is this breath-taking. 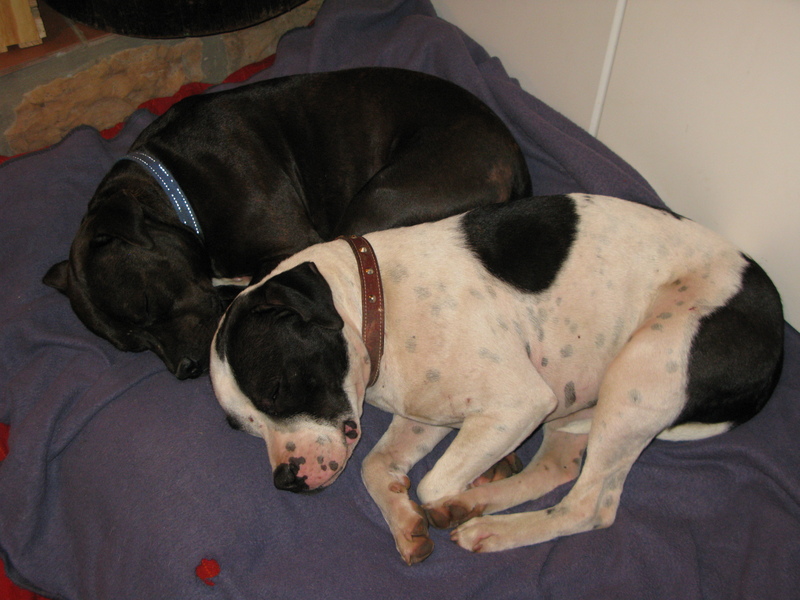 Happy-tired dogs falling asleep in front of the fire while spooning. Like we did. *** I was not traipsing across the mountain alongside him because I had to work. On a public holiday. Ghastly. If it makes you feel better, Robyn and Pat remembered their anniversary for the first time in four years this year!